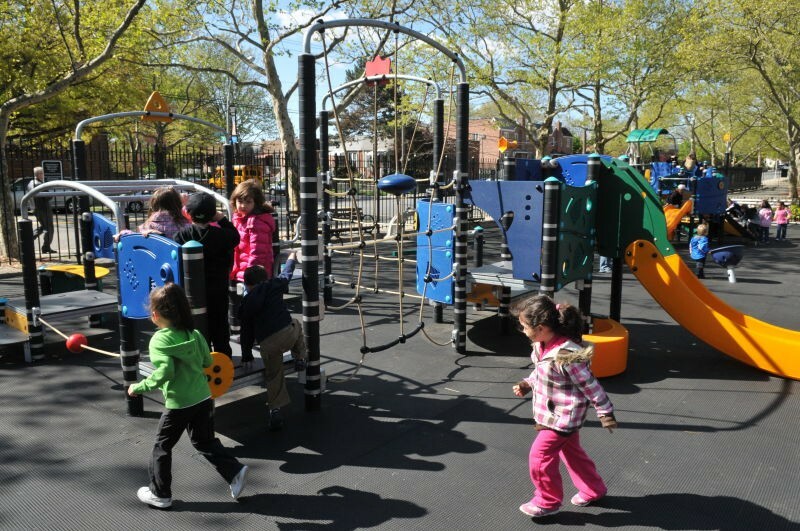 Juniper Valley Park in Middle Village, Queens is rich in natural, historical, and recreational resources. The park takes its name from the Juniper Valley Swamp, which covered an area of about 100 acres from Caldwell Avenue south to Juniper Valley Road. The swamp and surrounding area were blanketed by a thick forest of Juniper and White Cedar trees. Before the site of Juniper Valley Park was improved for recreational purposes, it was used variously as a farm, a cemetery, a source for peat moss, the property of a racketeer, and a garbage dump. The Pullis Farm Cemetery is located in the park on North 63rd Avenue near 81st Street. Thomas Pullis bought a 32-acre farm in Middle Village in 1822. The cemetery is one of the few surviving farm burial grounds in New York City and dates back to at least 1846. A 1932 survey found three marble grave markers: one for a child, one for “J.H.G.,” and a third for Thomas Pullis, Sen. and possibly his wife Elizabeth as well. In his will, Pullis prohibited the sale of the cemetery, and he left instructions to build a brick wall perimeter wall to protect it. Another portion of Pullis’s property was sold to the parish of St. Margaret’s for the site of their first church, built in 1860. The park site formerly contained a substantial deposit of peat moss—disintegrated and partially decomposed vegetable matter. A 1934 article in the Long Island Daily Press estimated that the peat bog measured 10 acres in area, 16 feet in depth, and 390,000 cubic yards in volume. During the Revolutionary War, the British cut down almost all local timber for firewood and ship-building, inspiring the residents to harvest the peat for fuel. Although peat moss was commonly used in Ireland, it never became very popular in this country. Juniper Valley Swamp’s peat source was almost forgotten until 1916, when construction of a railroad freight connection sliced through the bog and began to drain it. In the early 1930s the City of New York acquired the bog to settle a $225,000 claim in back taxes against the estate of the infamous Arnold Rothstein (1882-1928), who had been accused of fixing the 1919 World Series. Rothstein had purchased land in Middle Village on which he erected 143 flimsy houses with the hope of raising property values. Rejecting proposals to use Rothstein’s “Phantom Village” as the site of a municipal airport or as the site of the Queens civic center, government officials chose instead to develop the land for use as a park. The bog was mined to provide landscaping material for parks and parkways. The land and four adjacent parcels were acquired for park purposes between 1937 and 1949. From 1941 to 1942, squads of Works Progress Administration workers transformed the barren land into one of Queens’s most beloved parks. Plans called for paths, playgrounds, fences, benches, a wading pool, and a variety of athletic facilties for tennis, paddle tennis, badminton, handball, shuffleboard, ice skating, and bicycling. Baseball and softball fields were built on top of the Department of Sanitation’s former landfill dump. The extensive horticultural program included the planting of 168 new shade trees, 2000 rose bushes, thousands of shrubs, and vast lawn areas. Volunteer efforts have helped to green, restore, and maintain Juniper Valley Park. At the Pullis Farm Cemetery, volunteers have weeded and seeded, planted trees and flowers donated by the community, and installed flagpoles. In 1997 the Lutheran All Faiths Cemetery donated a new gravestone in memory of the Pullis family. 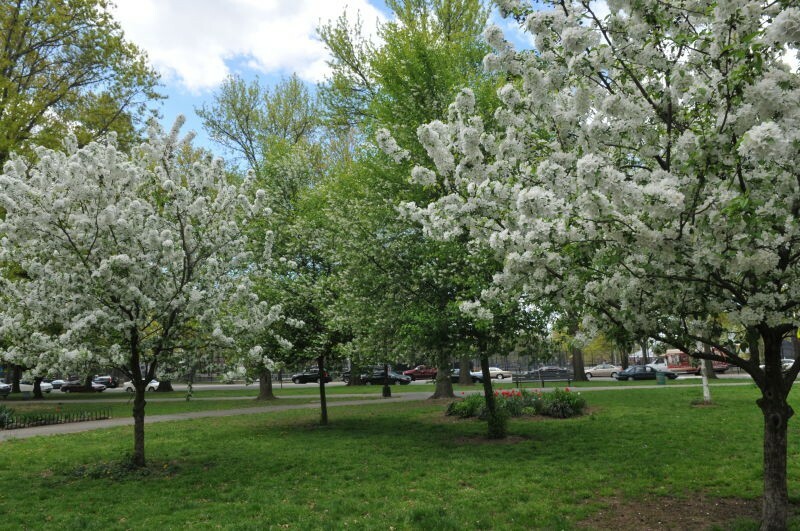 Outside the cemetery walls are newly planted trees, including evergreens, oaks, Flowering Apple, Flowering Cherry, and White Birch. Other volunteers maintain the tennis and boccie courts, plant flowers around the park house, aid in opening and closing facilities, and assist in keeping the park clean and green.